Armenia coach Sargis Hovsepyan was in charge of his first match for the hosts who looked comfortable early on and took the lead in the 14th minute through forward Marcos Pizzelli whose free-kick flew into the top corner via the underside of the bar. The visitors levelled through Ronaldo's spot-kick after Henrikh Mkhitaryan fouled playmaker Joao Moutinho. Ronaldo then put Portugal in front when he capitalised on a mix-up between Robert Arzumanyan and goalkeeper Roman Berezovski to score into an empty net. Three minutes later, the Real Madrid forward completed his treble with a stunning 20-metre strike into the top corner. Portugal midfielder Tiago was sent off for a second bookable offence just past the hour mark leaving the visitors to sit back and defend in the closing stages. Armenia's Hrayr Mkoyan reduced the deficit with his first goal for his country after a mistake by keeper Rui Patricio but Portugal held on despite coming under late pressure. Basement side Armenia are level on one point with the Serbs. 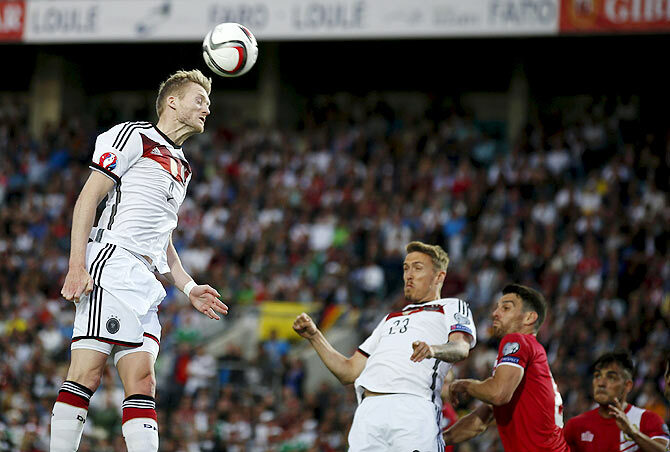 Germany's Andre Schuerrle scored a hat-trick for the world champions in their 7-0 thrashing of Gibraltar in Euro 2016 qualifying Group D on Saturday. Bastian Schweinsteiger had a penalty saved by keeper Jordan Perez after 10 minutes but Germany were gifted a goal after an unforced error by Ryan Casciaro allowed in Schuerrle who finished clinically after 28 minutes in Faro, Portugal. The floodgates opened after the break when Max Kruse rolled the ball home from close range and further goals came from Ilkay Gundogan and Karim Bellarabi. Schuerrle knocked in two more from close range and Kruse completed a brace with a sweetly-struck volley from the edge of the area. 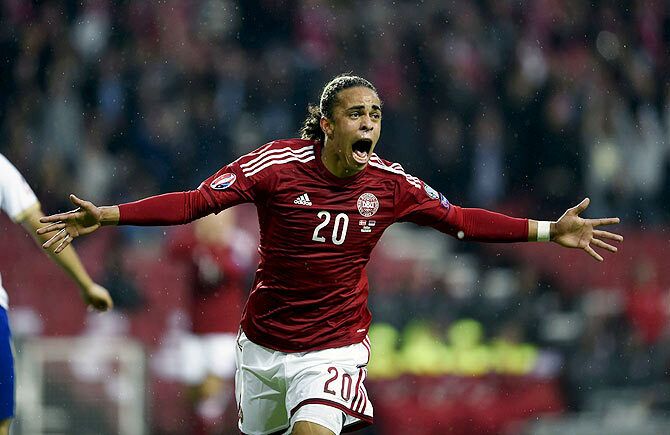 Yussuf Poulsen's first international goal and a late effort from Jakob Poulsen secured Denmark a 2-0 victory over Serbia in their Group I Euro 2016 qualifier on Saturday. Serbia, who have one point from five games in a dismal qualifying campaign, dominated the hosts for the entire second half but a combination of last-ditch defending and some spectacular saves from keeper Kasper Schmeichel sent them home empty-handed. Denmark took the lead in the 13th minute from a superb flowing move, Pierre Hojbjerg sweeping a long ball to Nicklas Bendtner whose deft touch placed it perfectly in the path of Poulsen who drove it home. The Danes could have gone two up just after the half-hour when Matija Nastasic clumsily tripped Pierre Hojbjerg but Denmark captain Daniel Agger's penalty was easily pushed away by by Vladimir Stojkovic. Behind at the break, the Serbs launched a second-half onslaught but Schmeichel pulled off a superb save to palm Aleksandar Mitrovic's powerful header onto the crossbar and away to safety. Schmeichel was soon called into action again, parrying a stinging shot from Adem Ljajic to keep the Danes' slender lead intact. The Danes spent much of the second half clearing their lines, Agger putting in a commanding performance at the back, manhandling the Serbian forward line and stealing the ball off the toes of the Serbs on several occasions. The sucker-punch came in the 88th minute when the Danes made a rare foray forward and substitute Jakob Poulsen held off Nikola Maksimovic to rifle the ball low past Stojkovic. Portugal's 3-2 victory away to Armenia earlier in the day means they top Group I on 12 points, with the Danes second on 10. Albania are third on seven points and a game in hand, with Serbia and Armenia rooted to the bottom with a single point each. Poland striker Robert Lewandowski struck the second-fastest hat-trick ever in European Championship qualifying inside four minutes in a 4-0 home win over Georgia in Group D on Saturday. Poland were leading 1-0 when Lewandowski added their second in the 89th minute, before he grabbed two more in stoppage time to put Poland a provisional three points clear at the top of the group. The win moves Poland closer to a third Euros helped by their shock 2-0 victory over group favourites Germany in October. They have 14 points from six games ahead of Scotland, who have 11 after a 1-1 draw in Ireland, and Germany, who were playing away at Gibraltar later on Saturday, with 10 points. front-runner," said Poland coach Adam Nawalka. Georgia manager Kakhaber Tskhadadze added: "Poland were like a machine (tonight) and this team can achieve a lot." The 57,000 fans at the National Stadium had to wait more than an hour for the first goal with Lewandowski wasting two perfect chances to open the scoring while his teammates also struggled to break through Georgia's five-man defence line. The opener came after 62 minutes when Lewandowski's 21-year-old strike partner Arkadiusz Milik fired home from 20-metres with a beautiful strike after a corner. Georgia came close to an equaliser when full back Georgi Navalovsky's powerful shot hit the bar minutes before Lewandowski came to life with his quick-fire treble. The Bayern Munich striker, who had suffered a frustrating night in front of goal, capitalised on two clever passes from Milik and one from his former Borussia Dortmund team mate Jakub Blaszczykowski to wrap up the points for the hosts. "It was definitely the first time I've scored so many in such a short time," Lewandowski said. Turkey's Arif Erdem scored the fastest European Championship qualifying hat-trick in three minutes against Northern Ireland in the Euro 2000 campaign according to Infostrada Sports. The Faroe Islands did the double over stunned former European champions Greece with a 2-1 home victory in their Euro 2016 Group F qualifier on Saturday. The Faroes showed that their 1-0 win in Greece last November was no fluke as they again beat the Euro 2004 winners, who are bottom of the group without a win on two points from six games. Hallur Hansson put the Faroes ahead after 32 minutes and Brandur Olsen added a second goal in the 70th before Sokratis Papastathopoulos reduced the deficit six minutes from time. Greece nearly scored in the first half as Nikos Karelis's shot was blocked on the line and Kostas Mitroglou hit the woodwork just before the Faroes scored on the break when Hansson turned in Solvi Vatnhamar's cross. In the second half, Faroes keeper Gunnar Nielsen turned a Karelis drive on to the post and Vasilis Torosidis thought he had scored but his effort was disallowed for a foul. Greece pushed forward for an equaliser but conceded again when Solvi Vatnhamar set up Olsen to shoot past Orestis Karnezis. Papastathopoulos headed in a corner late on to reduce the arrears but the hosts held on. The Faroes are now fourth with six points, five points behind third-placed Hungary who earlier won 1-0 in Finland. Romania lead the group with 14 points ahead of Northern Ireland on 13 after the top two sides drew 0-0 in Belfast. Northern Ireland missed the chance to seize control of Euro 2016 qualifying Group F when they were held to 0-0 home draw by top-of-the-table rivals Romania in Belfast on Saturday. A scrappy encounter occasionally burst into life with the hosts enjoying the better chances but failing to take any of them to the frustration of the Windsor Park crowd. Romania stay top with 14 points from six matches, one ahead of Northern Ireland and three clear of Hungary, who won 1-0 in Finland, who are second bottom with four, earlier on Saturday. The hosts should have claimed three points late but an unmarked Kyle Lafferty failed to make a proper connection when the ball fell to him inside the penalty area and Romania's keeper Ciprian Tatarusanu saved with ease. Manchester United defender Jonny Evans came closest to breaking the deadlock in the first half but his powerful header just before the interval was well saved by Tatarusanu. Lafferty fluffed another chance midway through the second half as the tackles flew in. The more technical Romanians did cause some problems and were almost gifted a goal when Gareth McAuley's careless pass sent Gabriel Torje surging towards goal but Evans came to the rescue, deflecting his shot just wide. Oliver Norwood forced another save from Tatarusanu and Lafferty's late miss meant the game ended all square to keep both sides on course for automatic qualification. "There's a sense of disappointment because we had the momentum in the second half," Northern Ireland midfielder Steven Davis told Sky Sports. "We couldn't really find that quality in the final third of the pitch. "Maybe it's a bit of an opportunity missed, but it's still a good point." Northern Ireland have never qualified for the European Championship and have not played in a tournament finals since the 1986 World Cup in Mexico.